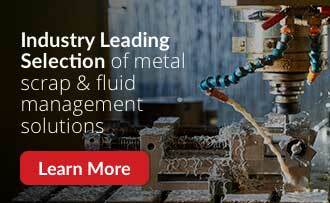 Process loose metal turnings into flowable chips. Scrap metal recycling system couples volume reduction with fluid separation to produce dry chips and reclaim 99% of valuable coolants and cutting oils. Infeed hopper with Screw Conveyor accepts chips and loose turnings and meter feeds the turnings into the shredder. Turnings Shredder uses energy-saving dual shafts that operate by ripping, cutting and tearing turnings into manageable, shovel-grade chips for further processing. Tramp Metal Separator effectively removes bar ends and other tramp metals from the chips, protecting the Wringer and other downstream equipment. Diagonal Shaft Wringer (available with air discharge or gravity discharge) efficiently removes moisture from chips with over 600 G’s of centrifugal force. Wringer Discharge Conveyor transfers processed chips to customer’s container (conveyor not shown in above photo). Settling tank with re-circulating drag conveyor provides automatic re-circulation of settle fines back into the system. Package includes an air-diaphragm pump for transferring fluid to holding tank of filtration system. Electrical control panel with HMI Panel controls all system functions.